The law change rolling back DNR wildlife plate fees and sending as much as 80 percent of those fees directly to the programs that depend on them took effect July 1. Tag offices from Camden to Cobb to Dade County are selling the eagle, hummingbird, quail and trout plates for only $25 more than a standard “peach” plate. Renewals are priced the same. Also, $19 of each purchase and $20 of each renewal will by law go to help Georgia wildlife, from bald eagles to bog turtles! Plates are the leading fundraiser for DNR’s Nongame Conservation Section – charged with conserving rare and other nongame wildlife – and the Bobwhite Quail Initiative. Neither receives state appropriations. 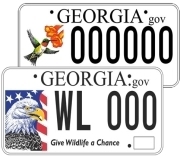 So … if you don’t have a wildlife plate, don’t wait for your birthday to roll around and the tag registration to arrive by mail. Upgrade to a wildlife plate today, and show your support! Learn how the money is used for nongame conservation and restoring quail and habitats. Loggerhead sea turtles won’t set a fifth straight nesting record in Georgia this summer. As of June 20, the nesting season midpoint, the Georgia Sea Turtle Cooperative had logged 464 nests. That’s about half the number through the same period last year, when the cooperative documented the most loggerhead nests – 2,289 – since comprehensive surveys began in 1989. Sea Turtle Program Coordinator Mark Dodd of DNR’s Nongame Conservation Section said the less-than-blistering pace continues, with 806 nests as of July 7. “We’re just having an average year,” Dodd said. The previous four summers have been anything but average. 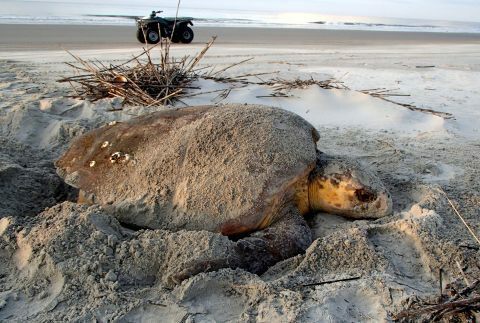 Loggerheads, a federally threatened species and Georgia’s primary nesting sea turtle, set consecutive records for nest totals, even topping 2,000 the past two years. Yet, average is also no surprise after the string of nesting highs. According to DNR’s quarter-century of survey data, annual fluctuations are more the norm. “It’s common to have several high years followed by a lower year,” Dodd recently wrote cooperative members. The outlook this year is “very close to the 25-year average of 1,201 nests,” with so-so nesting also reported at many other beaches in the Southeast, he added. Still, 1,000-plus is solid. (2007 saw a meager 689 nests.) And, with analysis already confirming that loggerhead nesting is on the rise in Georgia, Dodd can look at past years – when fat seasons followed lean ones – and see a possible surge in 2015. “Given what’s happened in previous years, we would expect a big year next year,” he said. Number of loggerhead nests in Georgia through June 20, plus season totals (in parentheses). 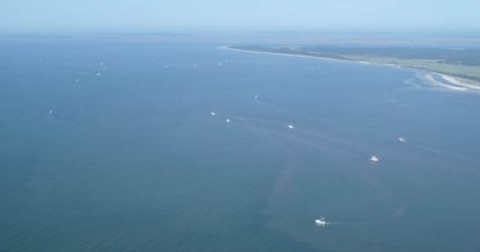 Shrimp trawling season opened in state territorial waters June 10. “Trawler mortality” is a major threat to the recovery of loggerheads. DNR surveys documented 155 trawlers on opening day, slightly more than the average of 145 over the past 15 years, according to Dodd. Sea turtle strandings rated above-average (14) the week after the opening, but no large-scale mortality was observed and no females stranded. Like most of you, my backyard wildlife watching typically ends when the last cardinal leaves the feeder. However, during the past few weeks, after the sun has set my wife and I have enjoyed sitting on the deck watching soft, blinking lights drift across our backyard. Seeing fireflies never fails to bring back fond memories of the golden years of our childhoods. 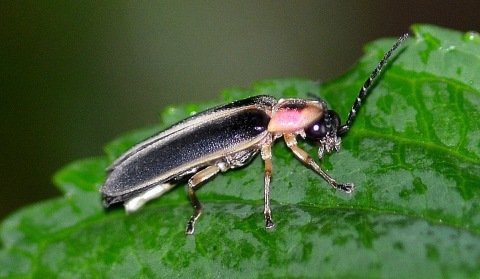 Read on to explore firefly myths, biology and even tips to make yards more friendly for these cool lights! Seventeen American oystercatcher chicks have been banded this year on the Georgia coast, and possibly 10 more will be, if they survive, according to DNR nongame wildlife biologist Tim Keyes. The young include two on Tybee Island (above), the first reported nest there in recent memory, and two at Gould’s Inlet on St. Simons Island, only the second time the species has nested there in years. 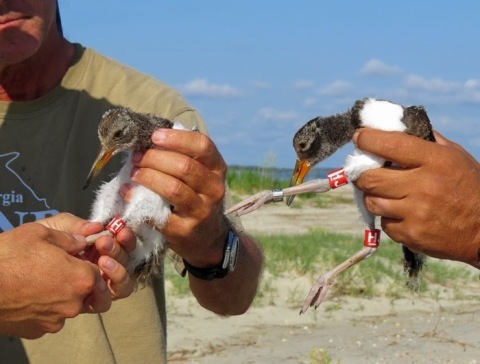 Banding helps scientists monitor oystercatchers, state-listed in Georgia as rare. Expect a bumper crop of longleaf pine cones this fall, according to a U.S. Forest Service report. Research ecologist Dale Brockway predicts an average of 98 cones per tree, the second-most on record and far more than the 49-year average of 28 cones a tree. 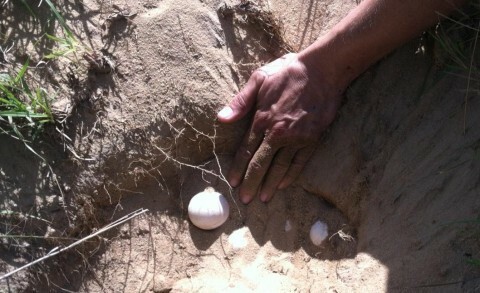 A search for gopher tortoise nests last week at Reed Bingham State Park yielded seven nests. Now protected with wire screen, the nests are part of a “headstart” effort that uses hatchlings to help repopulate gopher tortoises at places such as Yuchi Wildlife Management Area, where populations are too low. Media coverage. The push to reclassify West Indian manatees from endangered to threatened will receive more study following a 90-day finding to move forward with the review, according to the U.S. Fish and Wildlife Service. West Indian manatees can be found in tidal waters in Georgia March through October. The 2014-15 federal duck stamp went on sale last week. 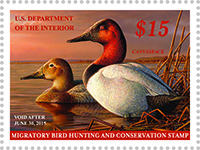 Although required for duck hunting, the stamps are also bought by other outdoor enthusiasts because 98 percent of the $15 fee goes to the Migratory Bird Conservation Fund, which supports wetland acquisition for the National Wildlife Refuge system, including in Georgia refuges such as Harris Neck and Piedmont. Names in the news: Mike Davis, a 27-year U.S. Forest Service employee and fire management officer for the Chattahoochee-Oconee national forests, received the 2014 Silver Smokey Bear Award during a May forestry conference in New Orleans. The award honors outstanding work in wildfire prevention at a regional level. DNR senior wildlife biologist John Jensen co-authored with Lee County's Jim Wright a Herpetological Review Natural History note on the river frog mass metamorphosis Wright documented last year near Leesburg ("Rare river frog event," June 12, 2013). 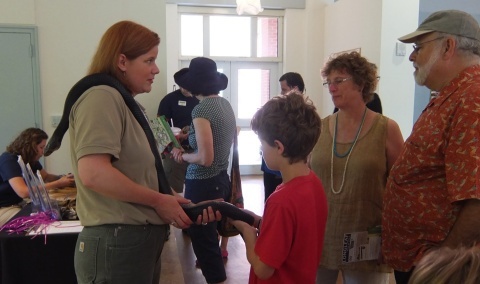 July 12: Reptile Day, Fernbank Museum of Natural History, Atlanta. Oct. 21-24: 2014 Longleaf Conference & Eastern Native Grass Symposium, Mobile, Ala.
at Atlanta Botanical Garden. About 2,600 people attended the May 31 event.